Visitors who want to spend a wonderful vacation in Branson will find the place to be abundant with restaurants, bakeries, cafes, and candy stores where you are sure to satisfy your taste buds with sweet treats. Dining in Branson is one of the most enjoyable activities that visitors want to experience during their stay in this great vacation paradise in the Midwest. For visitors with sweet tooth who are looking for some sweet treats can have the opportunity always to enjoy wonderful dining in Branson at The Fudgery, Sugar Leaf Bakery & Café, Dino's 24 Karrot Cake Company, Andy's Frozen Custard, and Grandma Ruth’s. 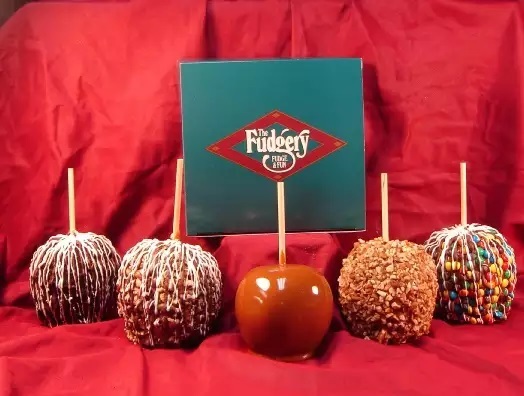 Fudgery is a chocolate store chain that has been combining amazing fudge with a wonderful and fun experience for thousands of satisfied customers since 1980. This awesome chocolate store in Missouri has three locations. Two stores in Branson can be found at Tanger Outlet Mall and Branson Landing and another one in Market Street in Saint Louis. Fudgery uses only the very best ingredients for all its products that make dining in Branson a unique experience. Fudgery in Branson is home to America’s favorite fudge with a rich, smooth, and creamy where every bite is sure to delight every taste buds. This chocolate store has lots of reasons why their fudge is everybody’s favorite. You will find in this store the finest all-natural ingredients that were handmade from scratch. The store’s delicious fudge is perfectly handcrafted by Candy Making Master and cooked in a copper kettle hand-turned on a marble slab. The deliciously prepared old fashioned fudge is a masterpiece that made Fudgery helped create favorite fudge in America. Fudgery has already been creating great fudge before the time of the cellphone where the first unit came bigger than the classic telephone handset. It was a time when A.C. Marshall revolutionized the tradition of making fudge with the grand opening of the world’s very first Fudgery store. Combining with his endless effort and using the best ingredient in his recipe, making fudge become a part for success of the Fudgery. His commitment to quality continues as he added ice cream, caramel apples, and milk shakes to an already successful fudge products. Sugar Leaf Bakery & Cafe is another store in Branson that offers the best cookie in town. The café owners Todd and Lori Jansen come from humble beginnings. Originally come from a small farm town of Atkinson in Nebraska, the couple has proven that with hard work, persistence and love of their work anything is possible. When they moved to Branson in 1996, their family of 6 began to grow and experience new opportunities that are unique to Branson. By 2004, Sugar Leaf Treats made their first cookie. When the demand of their cookies was beginning to grow, they knew they were in need of more space. They soon established their first store in the Engler Block and hired their first employees but still kept the majority of the work within the family. The couple has always been the first to extend a helping hand to anyone in need. This selfless couple has been donating pastries, breads, and meals to different charity groups. As years passed by, rumors spread of their homey café and delicious treats and their business began to grow. Some of their customers have fallen in love with the family atmosphere, some have fallen in love with the flavorful recipes and some ask their help for their wedding needs. With their mission to make each cookie and cake with as much flavors, and zest as possible, many who travelled to Branson seek out the great delights that they serve. The welcoming atmosphere and the enticing aromas are often hard to resist even for the unsuspecting passing shopper. Beautifully located by the fountains at Branson Landing, Dino’s 24 Karrot Cake Company is a great dining spot in Branson where guests can relax on the patio or inside the cosmopolitan-style café while enjoying the best cake in the Ozarks. Made with only the highest quality ingredients, their desserts are really incomparable. Even cake haters can’t resist to try its flavorful carrot cake. Famous for his impeccable piano showmanship, Dino Kartsonakis can bake the best cake in town. His skill in making delicious cake is evident with the loyal customers such as Denzel Washington, Tony Orlando and a host of other famous names. While the carrot cake is Dino’s specialty, there are a number of equally delectable choices, all created by Piano Showman himself. Chocolate lover’s dream come true in the rich and multi-layered chocolate fudge cake. The red velvet is a favorite of many loyal customers while cheesecake lovers can’t get enough of Dino’s newest creation: 24Karrot cream cheese cake. Another temping choice alongside the elegant Italian crème cake is the satisfying strawberry cake. Don’t just try the cake without the best paring of a coffee. Cheryl, Dino’s wife, hand selected the beans for the café. Whether you’re ordering a latte or just a regular cup of coffee, you’re sure to get special attention. Try Dino’s other offerings such as cake by the slice, cupcakes, loaf cakes and 10-inch cakes. They also take special events on request with spectacular custom cakes. 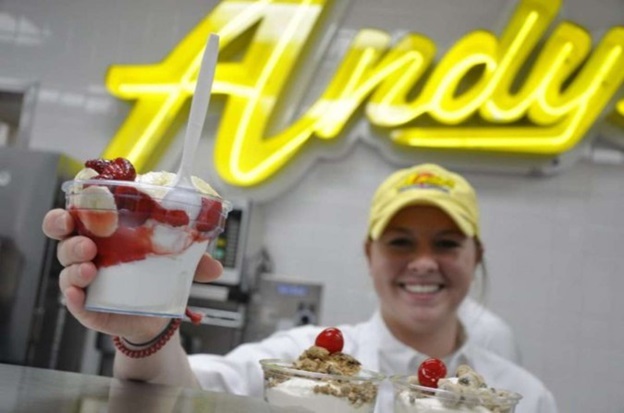 Andy’s Frozen Custard is another great dining place located on the Branson strip that serve locals and tourists alike. This dining spot has always been fanatical about custard, and has served it with pride since 1986. For over three decades, only the freshest ingredients have been used for a frozen custard experience that you can’t get anywhere else in Branson. The custard tradition of Andy’s started in Osage Beach, Missouri when John and Carol Kuntz embarked on a new frozen custard endeavor. Their product quickly became famous at the lake, and soon took nearby Springfield, Missouri by storm and then to Branson. It was at the original Springfield location where John and Carol’s son Andy and his wife Dana worked long hours learning the business from the group up. Their being fanatic to a supreme custard product and unmatched customer service never wavered. They always strive to expand and improve Andy’s Frozen Custard and they take the brand to a new heights with locations throughout Missouri, Arkansas, Colorado, Kansas, North Carolina, Oklahoma, Tennessee, Texas, and Illinois, with plans for locations in Florida, Arizona, and South Carolina. Grandma Ruth’s is another great place to stop by for rolls. Cinnamon, Toffee, Caramel, A Special Flavor of the Week and their new loafs made from the ends of the rolls. These tasty rolls are made fresh from scratch and baked daily. These mouthwatering treats will tickle your fancy and possibly even bring you back to the joyful days you experienced as a child. Many of Grandma Ruth’s customers from across the country and around the world have said just that. Stop by this place soon and maybe you can even meet “Grandma Ruth” herself as she still, lovingly prepares rolls to your liking. Don’t forget to remember when you bring the little ones to Grandma's place, she gives them a fresh, made from scratch sugar cookie. Grandma Ruth’s also offers quality entertainment. So, if your sweet tooth is longing for some sweet treats, don’t miss to visit Branson’s finest restaurants, chocolate and candy stores that offer mouth-watering sweet treats.